I am not a morning person. If possible, I should not be spoken to, nor, in particular, asked any questions in the morning. That’s why, perhaps, I’ve never had an easy relationship with breakfast (my granola phase was an exception). Before my starving, self-employed, full-time food blogger days, I used to drag myself to the coffee machine before even washing my face. After adding water and coffee, I would switch it on and then let the coffee drip down as I jumped under the shower. By the time the machine stopped, I was dressed and ready to go, so I would quickly pour my coffee into a thermos and rush to the office. Not a good way to start the day. Plus, add a cigarette to that coffee and it is called “Whore’s Breakfast” in Turkey (well, amongst my friends in Turkey). Not a nice name, I know. On the other hand, I have always loved eating everything associated with breakfast. That’s why, for years, I had breakfast in the middle of the night. What I am about to tell you should not be taken as an example by anyone, please! By the way, it is just a matter of time before my mom gets the hang of my old computer, starts reading my blog and finds out all about my bad habits. But still, this post will probably be buried into the archives before she gets the hang of it. And I sincerely hope that it will take her a couple of months to figure out how to use the scroll bar and the page navigation buttons. So I guess this is my last chance to write about my nasty midnight routine with no one nagging at me. Now, apart from waking up with a grouchy face, another bad habit I have is not being able to sleep when I am hungry. Most people can’t go to bed with a full stomach, but in my case it is the opposite. Most of the time, the menu goes like this: A few slices of bread or a bagel or croissants or brioche (basically whatever I baked and threw into the freezer that week). If it’s summer, definitely a couple of tomatoes. Peeled, sliced, drizzled with olive oil and sprinkled with fleur de sel at the last minute. One type of cheese – preferably Gruyere, Old Cheddar or Gouda. Two fried eggs (in butter, of course). And a few slices of fried pastirma (similar to beef jerky – read all about it here) or sucuk (similar to chorizo – which must be squeezed well in between paper towels to get rid of excess fat). The meal is consumed right before going to bed, accompanied by extra dark coffee. Just shoot me. Or not. Now that I’m working from home, I started having breakfast in the morning like normal people do. For proof, see Parmesan and Black Pepper Biscuits & Lazy Monday Morning Breakfast Galette. I even experiment and come up with new dishes with the ingredients I like. Today’s Egg in a cup is just one of those experiments. 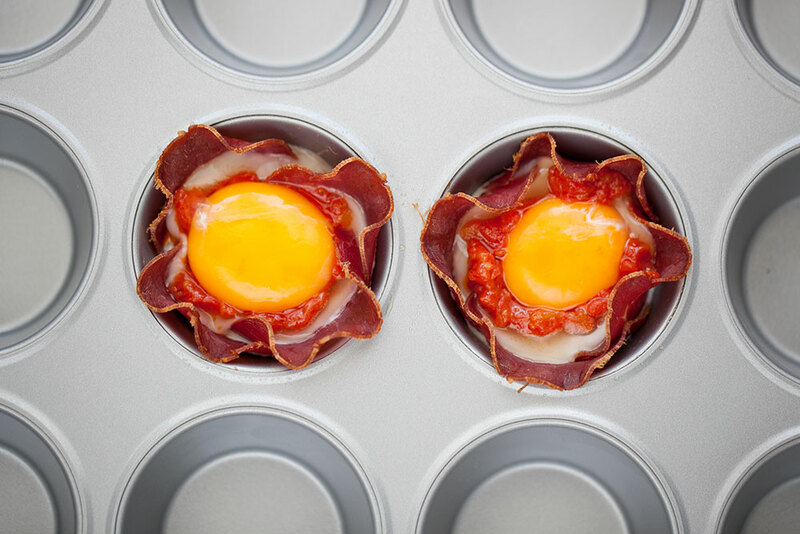 Oil your muffin tin and lay slices of pastirma (you can use bacon or ham for this) evenly into muffin cups. Cook in a pre-heated oven until crispy. Then, put one tablespoon of tomato sauce on the base. Next, add egg whites and cook in the oven until the whites get stiff. 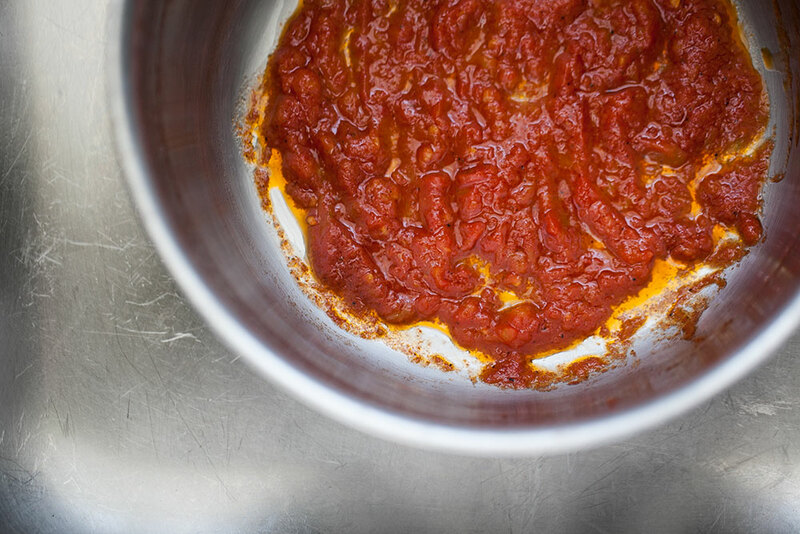 By the way, this tomato sauce takes only 3 minutes. Finally, add one more tablespoon of tomato sauce and then put egg yolks on top. Cook for 5-6 minutes, take it out of the oven and sprinkle some grated cheese on top. Now, there’s obviously a reason for the multi-step baking process. Actually, more than one. First, I like my pastirma (and you your bacon or ham) crispy. When you put everything inside and bake at once the pastirma never gets crispy. Then the yolks… They cook so quickly and the tops get all wrinkly after a couple of minutes in the oven, so I like to add them at the last minute. Here are my most favorite breakfast items in a cup. Recipe inspired by Gale Gand’s new book “Brunch“. To prepare the three minute tomato sauce, peel the tomato and squeeze to remove juice and seeds (if you do this in a bowl, you can use the juice and seeds later in a salad). Chop the tomato finely and cook with 1 tbsp of olive oil for about 2 minutes. Season with salt and pepper and put aside. 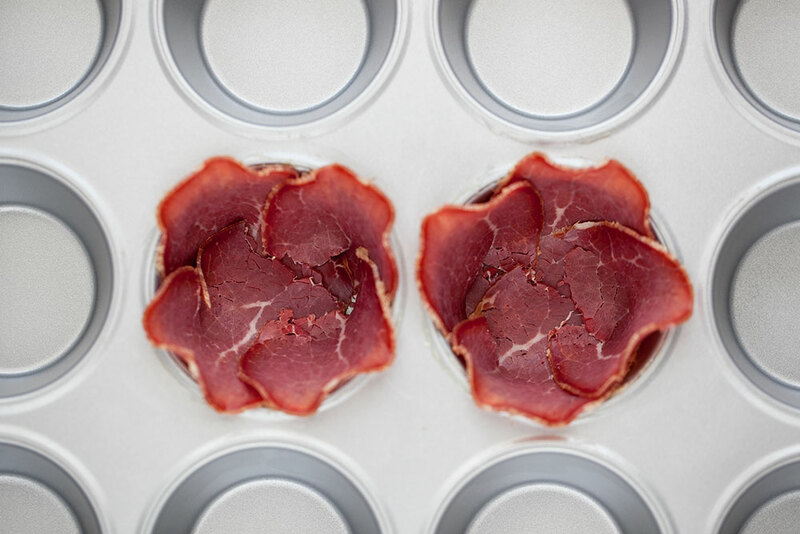 Take a muffin tin (if you don’t have one, you can use soufflé cups instead) and oil the cups with 1 tsp of olive oil, place the slices of pastirma inside, leaving a quarter inch overhang from the edge of the cup (be careful not to leave any gaps between or beneath the slices, though). Cook in the oven until crispy, for about 3 minutes. Take the muffin tin out of the oven, add one teaspoon of tomato sauce on the bottom and place the egg whites on the top. Cook until the whites are slightly stiff (the upper part should still be somewhat transparent, again 2-3 minutes at most). Take the muffin tin out of the oven again, add one more teaspoon of tomato sauce and place the egg yolks very carefully in the middle. At this point, I recommend to use the lower shelf of the oven (egg yolks cook very quickly and the tops get wrinkled with direct heat). 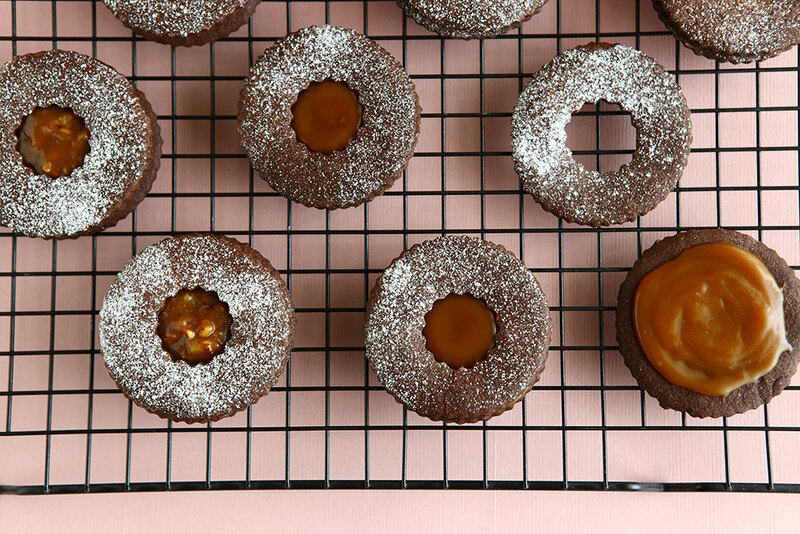 Cook until the egg yolks gently wobble when you shake the muffin cups, for about 5 minutes. Sprinkle grated cheese on the top and serve hot. that’s a really neat trick using the prosciutto as a cup. edible vessels of deliciousness! 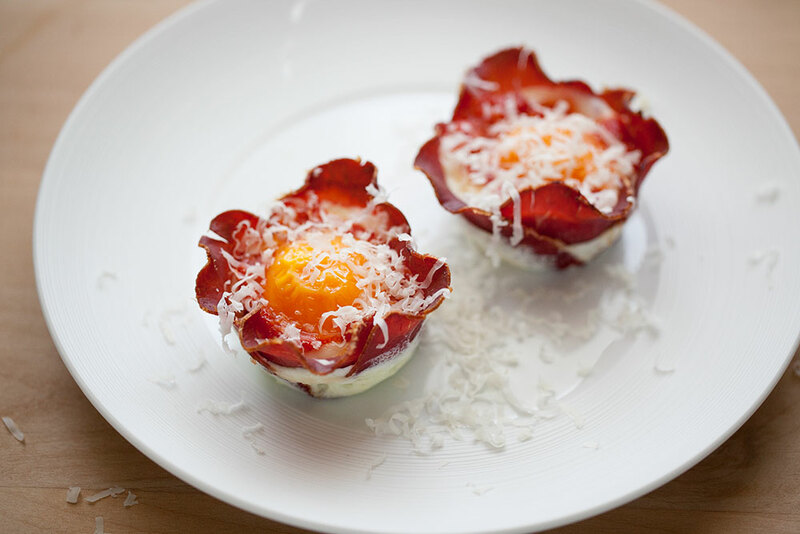 Fernando, this is a wonderful egg dish, reminds me of shired eggs, and the addition of the ham or proscuito is great. I like this kind of eggs… that are in between, and moreover I like your kind of presentation! Looks awesome! I’ll try this asap. Maybe I can use classic, tiny white cheese cubes instead of gruyere. Can we use Mortadella instead of pastirma ? Hope – I don’t think it will crisp up as nicely. I recommend bacon or ham instead. I think I’ll try to use pastirma ; because I don’t eat bacon or ham ..
wow! 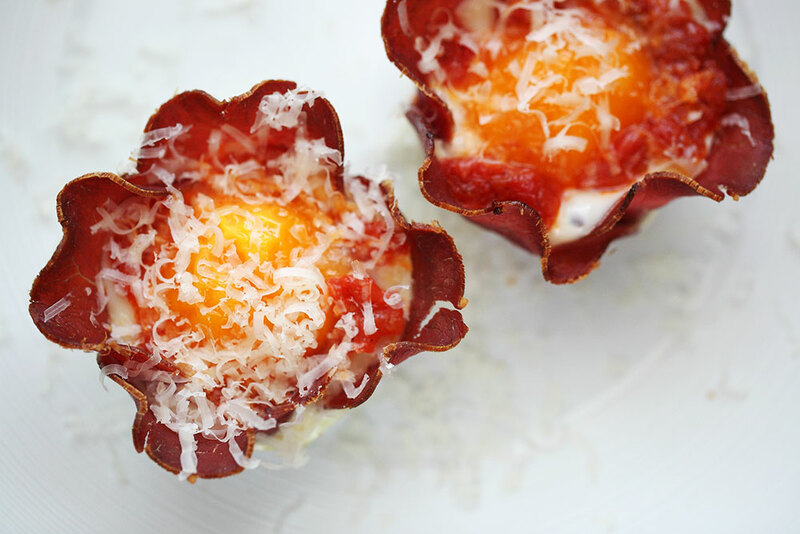 bacon cups! must make immediately! You’re too funny. I love “Whore’s Breakfast” and the pastirma and eggs look fantastic. Beautiful. I can imagine how crispy the pastirma will get when cooked. It looks so delicious especially with the tomato sauce under the egg. I’ll make a bacon version for myself I think, I never quite got used to the taste of pastirma. I just wanted to say you have a great sense of humor, and this is a brilliant post. I love it! Thanks for sharing it with all of us. This would make a great weekend breakfast. ….have to wipe the drool off my chin…. 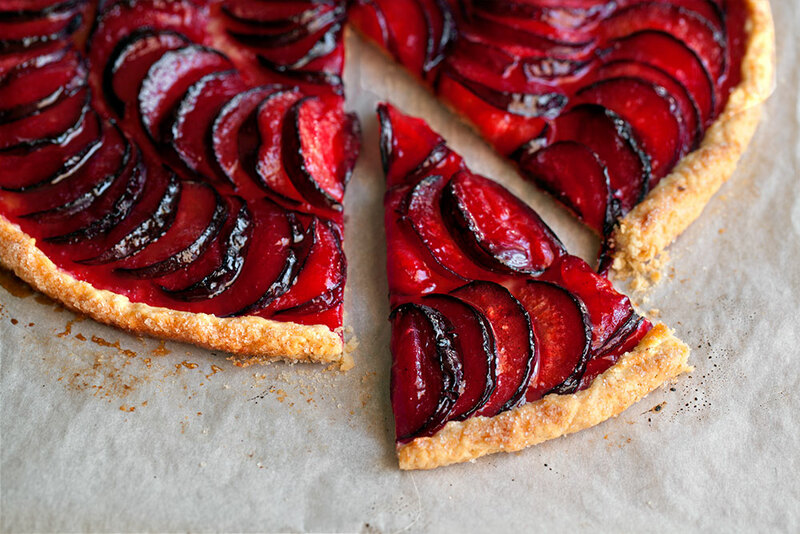 This looks scrumptiously decadent..and I am enthralled! When I was young My father used to make egg in a cup – very simple. I wish I could show him this recipe. I have done this recipe before and was always disapointed how it would turn out, the Ham would be cooked, but soggy, the eggs would overcook thus giving you a hard yolk, instead of a running one… so I’m totally in love with the trick of cooking the whites separate from the yolks… Brilliant! Definitely keeping this recipe for a future brunch. Beautiful! 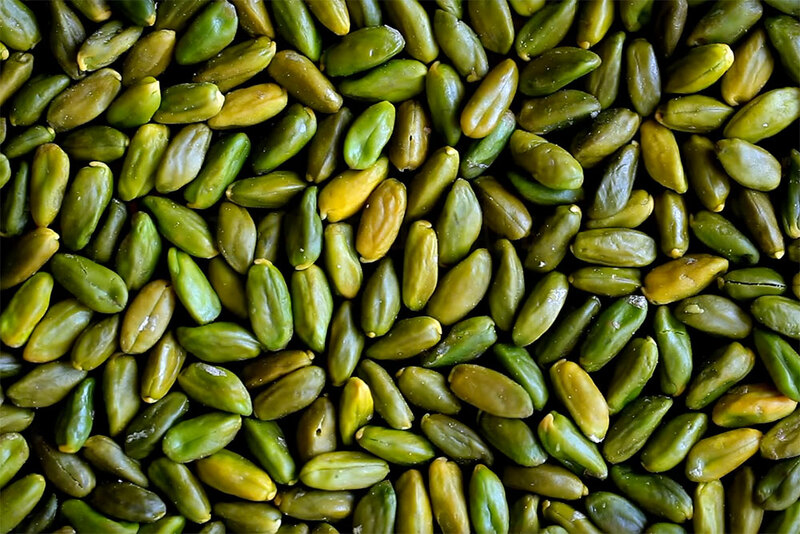 I can’t wait to try these one day. i m gonna serve this one for my friends tommorow! oh wow I’ve never seen this before but I’m willing to give it a shot. Thanks for sharing. Now I MUST check the Turkish version to see if I can spot “whore’s breakfast” in Turkish. I just have to know how to say that! as for the breakfast, being as lazy as I am, I’d just bung all this in the frying pan rather than the oven. It’s healthier that way, dontcha know. I’m not a morning person too, but I’d wake up for these eggs. Looks delicious. It just sounds mouthwateringly tasty! I think I will have some of that breakfast..tonight! “Whore’s breakfast”. Hahha. I wonder if it’s particular to people who work in the advertising industry as that’s what I used to call it, too, when I was in advertising. Love, love, love this recipe! 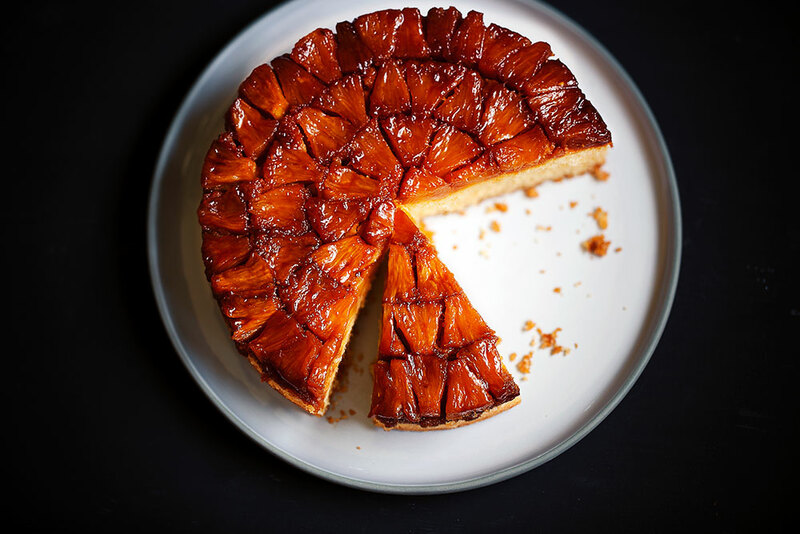 I’ve tried several variations of this and would serve it whenever I’ve weekend guests. It looks wonderful! I can’t wait to try this! AH!!! this looks amazing!!! and so simple!!! I made these this morning for my husband – I used prosciutto ham and roma tomatos for the sauce. It turned out so good! Thank you for a quick (but he didn’t know that!) and yummy new Sunday morning favorite! Marvellous!! I will try it!